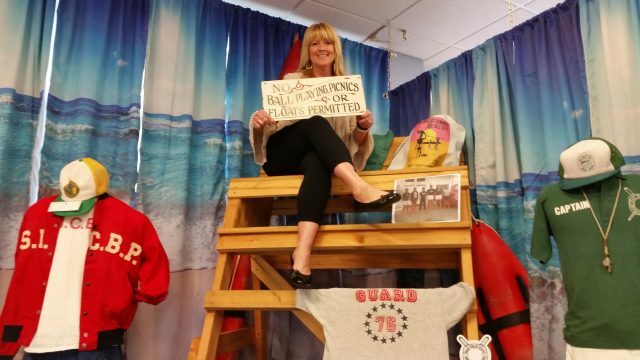 Abby Powell, president of the Sea Isle City Historical Museum, sits atop a replica of a lifeguard stand that is part of the new Beach Patrol exhibit. There are dozens of old black-and-white photos, vintage bathing suits and even a replica of a wooden lifeguard stand. A lifeguard boat oar from 1948 bears the signatures of Beach Patrol Capt. John E. Wilsey and the lifeguards who served under his command at that time. These and many other artifacts spanning from the 1930s to the present day comprise a new exhibit at the Sea Isle City Historical Museum that gives a colorful look at the Beach Patrol as it prepares to mark its 100th anniversary this summer. 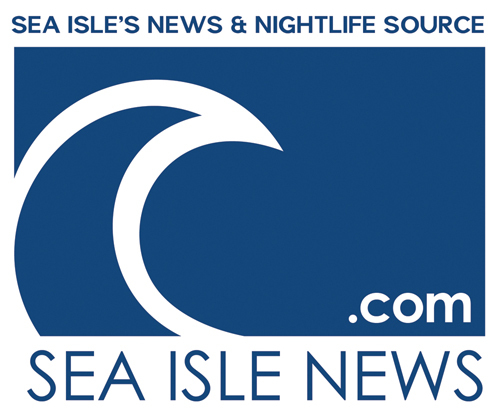 On July 11, 1919, the Sea Isle Beach Patrol was officially formed at 43rd Street to protect the throngs of bathers who vacationed in the popular resort town. It began with two lifeguards and three volunteers and grew into what it is today. The exhibit’s grand opening at the museum is one of the highlights among a host of family-friendly activities commemorating the history of the Beach Patrol. 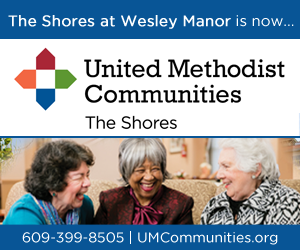 A weeklong celebration is planned in July, including a parade on the oceanfront Promenade. 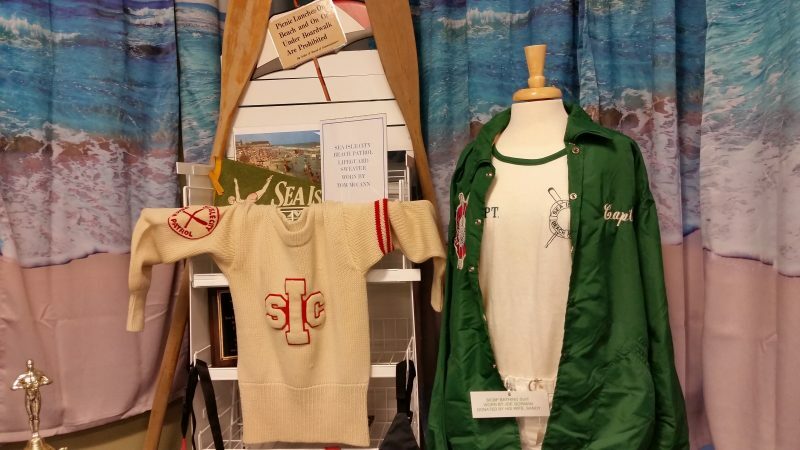 The display includes old uniforms and other clothing worn by lifeguards over the years. 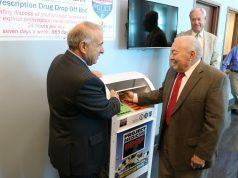 A Beach Patrol Centennial Committee, assembled by Mayor Leonard Desiderio, is organizing the special events and will make announcements about the dates and other details once they are finalized. Setting the stage for the big celebration, the museum’s free exhibit provides a fascinating overview of the Beach Patrol’s accomplishments and history. Vintage photos, for instance, transport museum-goers back in time during the patrol’s evolution through the decades. Abby Powell, museum president, noted that all of the artifacts are from Sea Isle. Many of them came from the museum’s own collection, while others were donated by former or current lifeguards. “It’s a big endeavor. So many people helped us so much,” Powell said during an interview Friday. 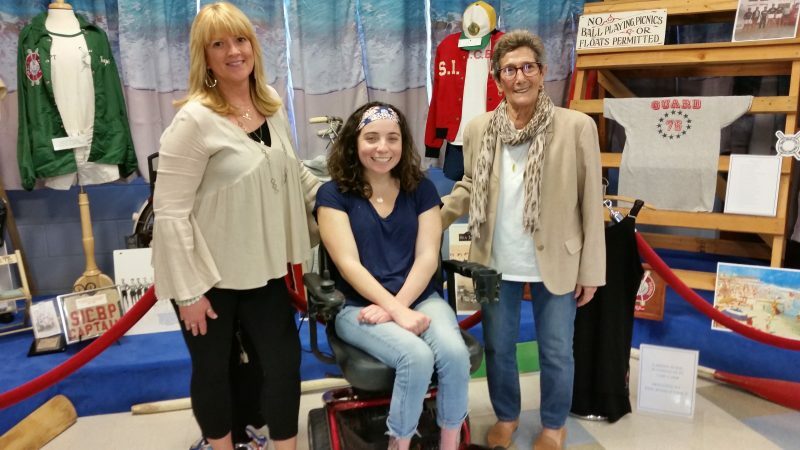 From left, Historical Museum President Abby Powell is joined by volunteers Alexis Keefer and Marie Peltier in front of the exhibit. Powell explained that the exhibit offers a special way to honor the city’s former and current lifeguards. Their names are listed in the displays that make up the collection. 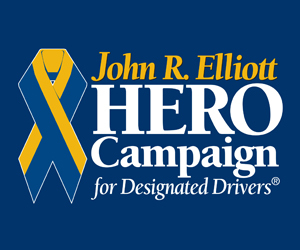 One document describes the heroism of the Beach Patrol members while assisting with the rescue and towing operations of an oil tanker that ran aground at 45th Street in 1976. Their work was credited with helping to avert an environmental disaster that might have happened if the oil had leaked from the ship. A cloth patch from the 1938 Beach Patrol is believed to be the oldest artifact in the exhibit, Powell said. Other items span from the 1940s to modern times. Old Beach Patrol uniforms on display include the whistles used by lifeguards. One noteworthy piece of clothing is a 1976 Bicentennial T-shirt that was worn by Renny Steele, who is the current Beach Patrol chief. Another eye-catching part of the exhibit is a replica of an old wooden lifeguard stand. Powell said the replica was part of a children’s display at Sea Isle’s National Night Out celebration organized by the Police Department. 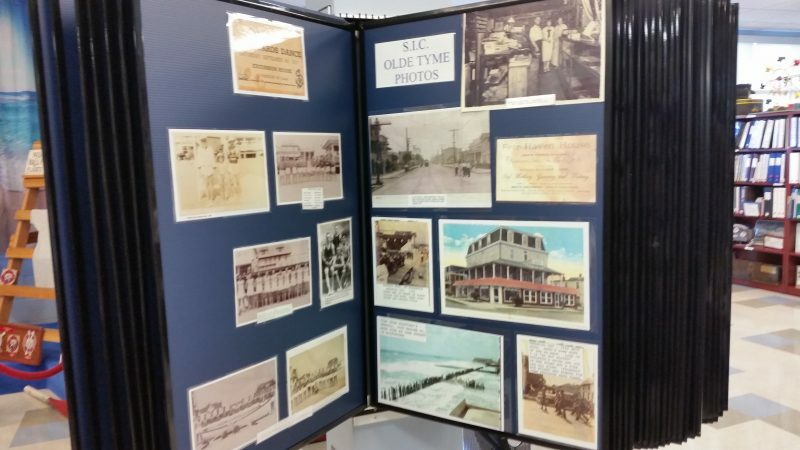 Museum-goers can flip through a collection of vintage photos to get a glimpse of “olde tyme” Sea Isle. The Beach Patrol exhibit temporarily replaces a collection of vintage wedding gowns, worn by Sea Isle brides, that has traditionally served as the museum’s centerpiece display. Most of the gowns have been carefully packed up and placed in storage. A smaller display of gowns remains in the museum, but the full collection will return in the fall, Powell said. 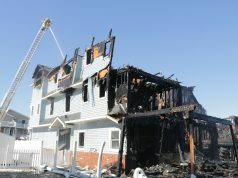 For more information about the Sea Isle City Beach Patrol exhibit and the Sea Isle City Historical Society and Museum, visit http://seaislemuseum.com/ or call (609) 263-2992.